If it's melodramatic to say that My Chemical Romance was a band to define a generation, then so be it. Melodrama is never something that frontman Gerard Way and co. have had tendency to shy away from, nor should they have had to. For every critic of their theatrical escapades over the years, there are ten fans waiting in the wings to fiercely defend them. When the group announced their split after a 12 year run, it brought tears to many eyes… and not just those who epitomized their ‘emo’ reputation. 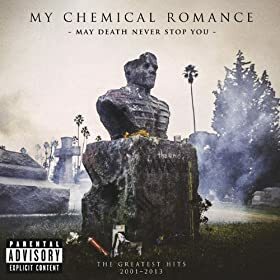 No matter what corner you find yourself fighting when it comes to MCR, there’s no use in denying that their credentials at least justify their final release, May Death Never Stop You, the well-deserved and victorious greatest hits record. With a track listing spanning each of their four studio albums, there’s something for any and all fans; whether part of the die-hard MCRmy or not. Each era of the band is catalogued into this 19 track offering; and whilst there will be undoubted disappointments in terms of the songs selected to document their career, they’ve made a commendable effort to represent the whole journey. And, let’s face it - you’re never going to be able to please everyone - taste is indeed subjective, after all. To those a little upset at their change in direction: you’re right, they may well have lost their edge a little toward the end of the line, but for a band so clearly energetic and eccentric, don’t you think that this was always inevitable? Not content to be tied down to one sound or genre, or indeed one ‘look’ or ‘theme’, MCR were always finding new ways to speak to their captive audience; from the darkness of I Brought You My Bullets, You Brought Me Your Love, right through to the conceptual nature of The Black Parade and beyond. It’s just down to you to keep your memories carrying on… see what we did there? From the now classic Three Cheers For Sweet Revenge, their most iconic and game- changing record of the lot (and potentially in the world… ever), it comes as no surprise when the ANTHEMIC "I’m Not Okay" makes an appearance – this is both expected and obvious. Bound to inspire volume dials everywhere to be turned one way (or another), it’s a track which spoke directly to their demographic and catapulted the band beyond limits which began to transform their career. Although this compilation is sadly lacking their sophomore record’s outstanding "Thank You For The Venom," a respectful nod is given in "The Ghost of You," "Helena" and "You Know What They Do To Guys Like Us In Prison." Representation of the band’s remaining three albums is duly given; for the most part, chronologically. But add in a few demos and extras, as the band have, and it’s clear to see that they’re on to a winner. Throw in the 2 hours of bonus DVD footage, and you’ve certainly a reason to relive your teenage angst vicariously through their performances - music videos and live. My Chemical Romance faced trials and tribulations throughout their time as a band, and yet despite their various internal dramas and that Daily Mail article, they somehow always managed to come out on top. Whether you’ve an overwhelming desire to reminisce or quite simply, you aren’t ashamed to admit that you never quite lost your love for a band synonymous with your teenage years, make sure you give the affectionately named ‘My Chem’ the final send-off that they deserve.